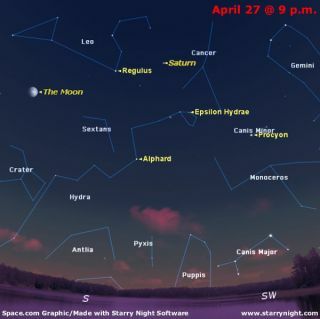 SKY MAP: The sky as seen at 9 p.m. on April 27 from mid-northern latitudes. Still shining sedately with a yellowish-white glow high inthe southern sky after sunset is the beautiful ringed planet, Saturn. Not toofar south of Saturn you can find a little group of five or six stars that marksthe head of Hydra the Water Snake, one of those curving streams of stars whichsuggested a celestial serpent to the ancient imaginations. Hydra is actually one of two snakes in the sky. Hydrarepresents a female snake; there is also a male snake named Hydrusthat can be found curled in the far-southern sky. If you extend an imaginary line from Denebolato Regulus in Leo and extended it as far againbeyond, that will lead you to the head of Hydra. The bright star Procyon, in Canis Minor canalso be used as a guide for finding Hydra's head, for it lies less than10-degrees due east of Procyon (your clinched fistheld at arm's length measures roughly 10-degrees). The stars in Hydra's head make a rather attractive group in7-power binoculars. One of them, the northernmost star in the circlet, EpsilonHydrae, is one of the most outstanding examples of a multiple star system,astronomers having discovered no fewer than five stars here revolving abouteach other. Two-star and three-starsystems are known to be common. From there, if you have access to a clear and dark sky--andkeeping in mind that Hydra's stars are for the most part rather dim--you canfollow the scraggly stream of the Water Snake's body as it goes south and eastbelow the Sickle of Leo, past the faint goblet-like star pattern of Crater theCup and the moderately bright four-sided figure of Corvusthe Crow, then south of the bluish star Spica beforefinally coming to end near Libra the Scales. As you might have guessed by now, Hydra is the largest andmost extensive of all the constellations. At mid-northern latitudes it takeswell over seven hours for the entire figure of Hydra to rise. Its head hasalready passed the meridian as darkness falls this week; the tip of its tail,however, does not pass there until around 1:30 the following morning. Hydra's brightest star, not far below its head, isdistinctly ruddy in coloration and shines about as bright as Polaris,the North Star. Its name is Alphard, which means"the Solitary One." It's also known as Cor Hydrae, orthe Heart of the Hydra. Once you locate Alphard, you'llimmediately understand why it was so named; for it's the only conspicuous starin the large dull region of the sky that lies below Leo's Sickle. For this reason,Alphard appears brighter than it really is because ithas no competition nearby. Some star guides suggest that Hydra commemorates the fabledmulti-headed Lernaean Hydra that gave the mightyHercules so much trouble in the second of his twelve labors; when he cut offone of the heads, two others would sprout in its place! To make things evenworse, one of those heads was immortal and could not be killed. Hercules,however, was able to dispose of the Hydra by enlisting the aid of his nephew, Iolaus, to stand by with a torch. Each time Herculeschopped off a head, Iolaus cauterized the stump toprevent any heads from growing back. As for the immortal head, Hercules simply rolled a giantboulder over it, rendering it helpless. That might be why, in the sky, our celestial Hydra only hasone head. And that may also be why, when all but the tail of Hydra has setbelow the southwestern horizon that the constellation of Hercules standstriumphantly directly over our heads. Joe Rao serves as an instructorand guest lecturer at New York'sHayden Planetarium. He writes about astronomy for The New York Times and otherpublications, and he is also an on-camera meteorologist for News 12 Westchester, New York.